Do Bananas Neutralize Stomach Acids for an Ulcer? Ulcers are not a result of stress, but they can certainly cause it. Ulcers are characterized by sharp pains after eating and may be accompanied by belching, nausea and loss of appetite. If untreated, ulcers can eventually require surgery. 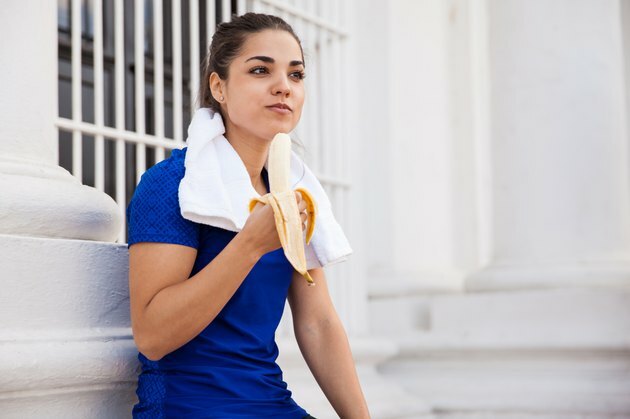 Fortunately, there are things you can do to lessen the discomfort, and eating bananas is one of them. Ulcers are open sores in your stomach, or at the place where your stomach and intestines meet. Ulcers can be caused by injury to the mucous lining, overuse of NSAIDS -- nonsteroidal anti-inflammatory drugs -- or by a bacteria called H. pylori. This bacteria may increase the amount of ammonia in your stomach so that it can survive. Symptoms caused by ulcers are generally treated with antibiotics, antacids and lifestyle and diet changes. Bananas are high in potassium, magnesium and manganese. They also contain fiber, vitamins B6 and C, and folate. One medium banana has about 100 calories. Bananas may also contain an enzyme that helps inhibit the growth of the bacteria that causes ulcers, though many more human trials are needed to confirm this. Bananas are a natural antacid, which may help protect against ulcer development. Leucocyanidin -- a component of bananas -- also increases the thickness of the mucous membrane of the stomach, adding additional protection against potential damage caused by ulcers. Diet and lifestyle changes can be useful in treating symptoms caused by ulcers, but they aren't an appropriate substitute for professional medical advice. Don't attempt to diagnose an ulcer, or treat one yourself if you have been diagnosed. Talk to your doctor about any complementary and alternative treatments that you may be interested in before trying them. Health Care Online: How Many Calories in a Banana?